X-treme Skid Steer Rock Buckets. Bigger is better with the CID X-treme skid steer rock bucket. With the CID skid steer rock buckets you can sift through tons of dirt and gather lots of rocks and stones leaving your dirt ready for grading or other things. It can also be used for cleaning up and general use. 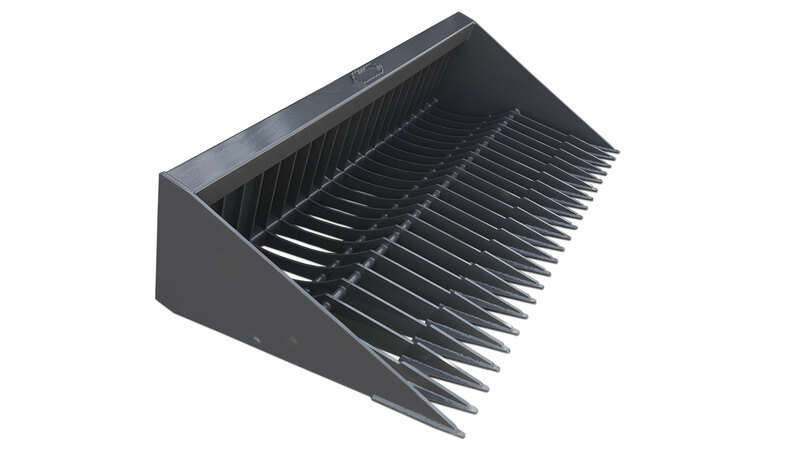 The rock buckets come with 3” tine spacing, 3/8" tines, and dual 1 ¼" rods to reinforce the 5" tall rock dam. It has fully welded front tines in place of cutting edge. They will also work with compact track loaders and compact tractors by building it with the correct mounting plate. X-treme Skid Steer Rock Buckets Spec. Dual 1 ¼" rods to reinforce the 5" tall rock dam.